You’ve been asking for ’em, and we’ve got ’em: Meet CandyShell Grip for the Samsung Galaxy Note 4. 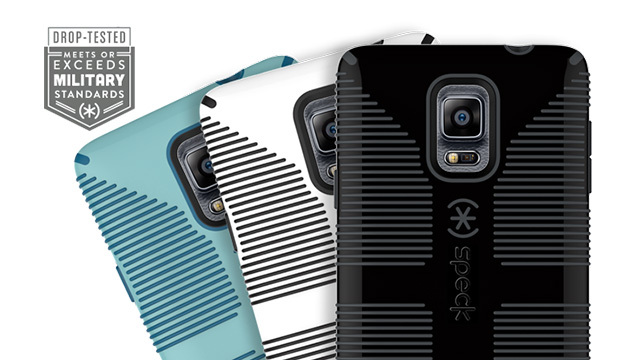 Meet the best protection for your favorite new Samsung smartphone. We were psyched to see all of the cool things the new Note 4 can do, and we’re prouder than ever to introduce military-grade slim protection for Samsung’s latest masterpiece. Like all of our CandyShell Grip products, this Note 4 case is equipped with rubber ridges for added grip to give you the perfect hold while texting, gaming, and snapping photos. Plus, when you buy a Note 4, Beta News reports on all of the freebies that Samsung hooks you up with, like 50 GB of Dropbox storage. And since this phablet is packed with the highest resolution on a smartphone yet, Samsung has teamed up with The Wall Street Journal, The New York Times, and Bloomberg Businessweek to give you FREE short-term subscriptions! Even though the phablet business has been shook up with the introduction of the new iPhone 6 and iPhone 6 Plus, CIO says there are still plenty of reasons that the performance of Note 4 may surpass Apple’s. If your favorite color of CandyShell Grip for Note 4 sells out quick, be sure to sign up to be notified when your favorite color is back in stock. Our New Galaxy S7 Cases Are Here + What You Missed At Unpacked!